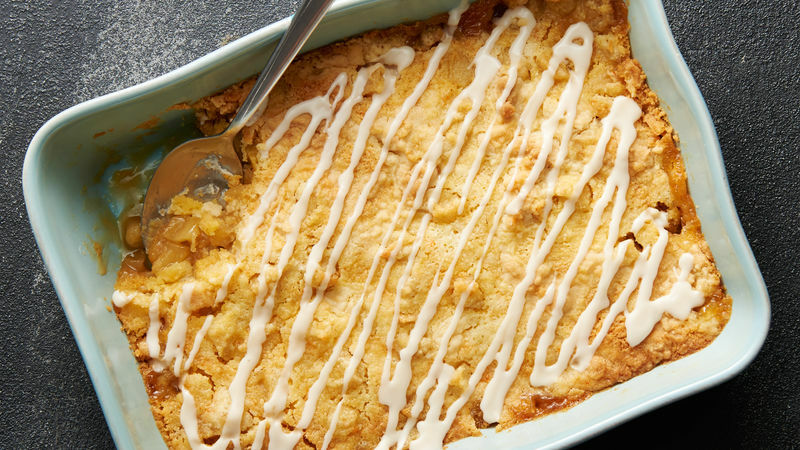 In baking dish, mix chopped apples, 1/2 cup syrup and the brown sugar. Spread evenly in pan. Top with dry cake mix; gently shake pan to distribute evenly. Pour melted butter over top, tilting pan to cover as much of the top with butter as possible. Bake 42 to 45 minutes or until top is golden brown, mostly dry on top and bubbly around edges. Cool 15 minutes. In small bowl, mix powdered sugar, remaining 2 tablespoons syrup, the water and maple extract. Drizzle over cake. Granny Smith apples hold their shape well when baked and aren’t overly sweet, which makes them perfect for this cake. Maple extract is a great way to boost the flavor in baked goods, frostings or glazes, but a little goes a long way, so make sure to measure carefully.